New for November 2016! And special thanks to Justin, who helped us with this page, and others, over the years. There are many ways to test an antenna (called the AUT, or antenna under test), and lots of parameters that can be tested, but the first decision you’ll need to make is whether to conduct your tests indoors in an anechoic chamber, or outdoors at an open air test range. You will have more control in a chamber, but there are size restrictions and it can be very pricey. If you move outdoors, you must deal with more interference (physical and regulatory) and you will be subject to the weather, but outdoor conditions are probably closer to your real-world application. In either case, you'll want to get as close to installed performance as possible - for example, have it mounted on the vehicle/platform you're actually going to use to get all the important interactions that affect the far field radiation pattern. Sometimes, you'll see the outdoor range referred to as an OATS (that's Open Area Test Site), particularly in the EMC and commercial worlds. These will typically have a really good conducting ground plane. Many EMC and commercial test ranges actually depend on a strong, consistent reflection off this ground plane and account for it in their processes. Thanks to Google maps' satellite imagery, you can see hundreds of outdoor ranges around the world, and catch a glimpse of what your competitors are up to. 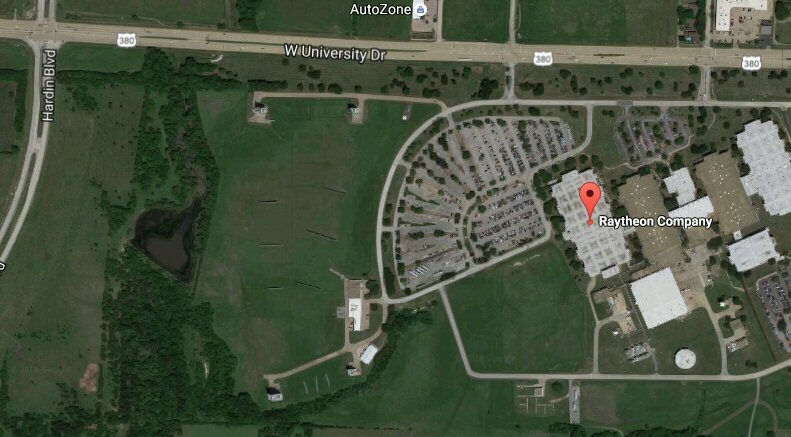 The range below is in McKinney, Texas. There are three towers for taking data, with what could be some diffraction fences between them. The grass appears worn down by foot traffic, maybe this range is used to measure radar cross-sections and hardware is placed in the middle, we don't know. It appears that a sewage treatment pond is located to the west, but maybe that mess is what Texas calls a lake. Isn't industrial zoning great? Can someone please find us a satellite image of an antenna range with a fighter aircraft mounted on a mast? Radiation Pattern Patterns of antennas can be measured in transmit or receive mode as they are typically reciprocal devices, though most of the time you'll just measure the AUT in receiving mode. Because it isn’t really practical to measure the entire, 3-D pattern all at once, you’ll most likely measure slices of the pattern (called pattern cuts) by changing the elevation (EL) or azimuth (AZ) of the device you’re testing. The easiest way to do this is mount the antenna onto a positioner that can rotate as needed. Directivity Once you’ve measured the radiation pattern, you can calculate directivity as the ratio of 4π times the maximum radiation intensity to the total radiated power by the antenna. Gain The power gain of an antenna is often calculated by comparing measured S21 results to those of a standard antenna whose gain is known, or sometimes to a hypothetical isotropic antenna (for gain of a linear antenna: dBi = decibels with respect to an isotropic radiator, (you might also see “dBil” to reinforce the “linear” polarization aspect). For a circularly polarized antenna, dBic is reference of a hypothetical circularly polarized isotropic radiator. Here's an off-site link that will show you the derivation of the Friis transmission formula, which is fundamental to gain measurement. Look for Harald Friis in the Microwave Hall of Fame. Polarization To measure polarization, you need to rotate the antenna in the plane of polarization, while recording the response. Assuming plane of polarization is normal to the direction of the incident field, the recorded signal describes a polarization pattern for an elliptically polarized antenna. Most modern ranges measure 2 orthogonal linear polarizations and synthesize the polarization they want in post processing (you need good phase measurements for this technique). However, it’s still common for ranges to just match the polarization of the AUT with their range antenna, e.g. a circularly-polarized antenna with matching sense or a linear antenna rotated along with the AUT to always remain co-polarized. Using this technique will not provide any cross-polarized info about the AUT but sometimes you don’t care about that. There are four common ways to measure in the far-field. Reflection A reflection range makes use of a constructive interference between the direct radiation from the antenna and the specular reflection from the ground. This requires that the ground surface be very smooth, and both the source and the antenna you’re testing be positioned carefully. Elevated Both the source and the receiving antennas are mounted high, on towers or roofs, thus minimizing reflection from the ground. In some cases, a diffraction fence may be included to reduce ground reflection. Slant A slant range just elevates one of the antennas onto a roof or tower, and the other remains on the ground. In general, this type of range requires less space, but requires a taller roof or tower, than a range where both ends are elevated. Another approach is to take all your measurements in the near-field of the antenna you’re testing, and then calculate the far-field characteristics. By measuring only the near-field, the range can be quite small, and therefore testing can be performed indoors, which allows for greater control and less impact from environmental factors. Near field means that the path is just a few wavelengths, so that it does not come close to approximating a plane wave. Near-field ranges can be quite small, even coffin sized, placed in a clean-room. Near-field measurements are typically acquired using a probe to scan the field over a predetermined plane, cylinder, or sphere, where either the AUT moves and the probe stays still, or the probe moves and the AUT is stationary. Depending on the shape you use, the analysis to find the far-field data can get very complicated. Planar This technique moves a probe over a plane in front of the antenna being tested, varying the X and Y dimensions, keeping Z constant. It records the amplitude and phase of the received signal. This type of measurement works well for high gain and flat antennas. It is also the least expensive approach and requires simplest computations. Planar near field scanners can be either vertical or horizontal, with the horizontal setup better for dealing with gravity effects (e.g. space antennas that would deform if held for vertical measurement). Cylindrical This technique rotates the antenna around the z axis, and moves the test probe on the cylindrical surface at various heights relative to the XY plane. Cylindrical scanning lets you measure the exact azimuth pattern (360 degrees), but only a truncated elevation pattern. Spherical This technique rotates the antenna around the z axis, and moves the probe in a series of circles. This gives the most accurate measurements for the entire space, and is typically used for low gain and omnidirectional antennas, and antennas with controlled sidelobe levels. Because it does require more complex computations, it can be more expensive and take more time.